It's always good to start with a definition. 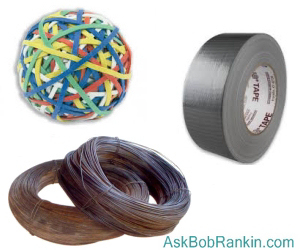 I like to call the Windows registry "a hideously complex ball of string, rubber bands, duct tape and bailing wire that's supposed to keep track of Windows system settings, your hardware configuration, user preferences, file associations, system policies, and installed software." It was intended to be an improvement on the simple text-based INI files that stored Windows configuration settings, but apparently too many pocket protectors were involved in the design. One advantage of the registry is that it enables each user of a machine to maintain his/her own settings; each user can have a unique theme, speaker volume setting, set of apps, and so on. But the registry can also apply settings to all users, or a group of users specified by the system administrator (e. g., “adults” and “kids”). The registry is one of the most important files on your hard drive. It may be necessary to edit the registry to correct an error or corruption; to add a setting that is not part of the original design; or to prevent some system activity that is undesired. The registry is a very powerful tool, and if it’s used incorrectly, YES, it can wreak havoc on your system. But with a basic understanding of how it works, and some simple precautions, you need not fear. Even if your Windows installation becomes unbootable, you can recover your old, working registry using the tools on the System Recovery USB drive that you created. If you have not created one yet, here is a link to how to do it. 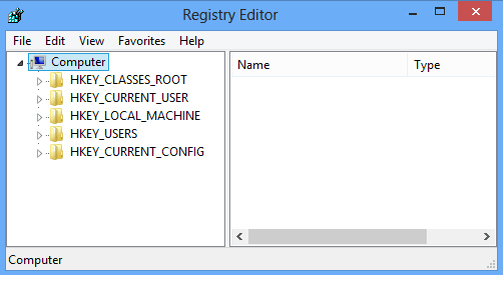 A few paragraphs earlier, I mentioned that you can make a backup of the registry by using the registry editor. Let's do that now. Click File, then Export. In the lower left corner of the new window that opens, select "All" under Export Range. Enter a filename, and click the Save button. It will take a minute or so to create the backup. Don't be surprised if the lights flicker, or if you hear a deep, guttural moan emanating from your computer. Returning to the registry editor window, at the top left corner we see link containing the word “Computer” -- think of that word as the trunk of a tree. Beneath it, in the left-hand window pane, we see the names of five branches: HKEY_CLASSES_ROOT, HKEY_CURRENT_USER, etc. Click on any of these brahch names (called “keys”) to see what further branches lie below it. Keys can be nested up to 512 levels deep. We won’t be going that far! The prefix “HKEY” indicates a registry “hive,” the top level of this hierarchical database. “CLASSES_ROOT,” “CURRENT_USER,” etc., are names for hives, each of which contains more levels of data that are all logically connected to the hive’s subject. “HKEY_CURRENT_USER” is a hive that contains settings which apply to whoever is currently logged in to the computer. If you click on that hive name to expand the tree below it, you will see familiar names like “Control Panel,” “Printers,” etc., along with mysterious labels of system resources that most users don’t need to know about. What you do need to know is that it is critically important to make edits in the correct hive and the correct sub-branch of that hive. A change to HKEY_USERS instead of HKEY_CURRENT_USER may have unintended consequences for all users of a machine, not just you. Navigating the tree structure of the registry must be done with the utmost care. Fortunately, there are lots of helpful geeks who provide exactly the right paths to take you where you need to be in the registry. In my articles, you will find instructions such as “navigate to \HKEY_LOCAL_MACHINE\SOFTWARE\Policies\Microsoft\Windows…” Just highlight the path name, copy it, and paste it into the address bar at the top of the regedit window. In the right-hand window, you will see a DWORD named, “System.IsPinnedToNameSpaceTree” (you may need to expand the “Name” column to read the whole name). Its value is set to 1 by default, meaning OneDrive in the sidebar is “on.” Double-click on that DWORD name and change the “Value data” to zero (0), then click OK. Close regedit, reboot, and OneDrive will be gone. If you ever want it back, repeat this procedure and change the zero back to a one. It's also possible to make changes to the registry with a REG file that someone else has coded for a specific task. For example, you can add a new option "Open with Notepad" to the context menu that appears when you right-click on a filename. This is handy when you want to quickly edit a file that doesn't end with the .TXT extension. Download this ZIP file file, click to open it, and then double-click on the Open-With-Notepad.reg file. Click your way through a few "Do you really want to do this?" prompts, and it will add a key to your registry. Now you can open any file (regardless of the extension) with the Notepad editor, using the context (right-click) menu. Most recent comments on "Don’t Be Afraid To Edit Your Registry"
the one thing I would like to find and change in my registry is where files land when downloaded or imported. yes I know I can often specify where I want them, but I would like them to automatically go to a folder I call C:\~dl (for download). is this do-able or need I lump it? I'd just love to know how to edit whichever registry area that switches Microsoft Edge from always opening itself when Chrome is my default browser. I can run Ccleaner and it always has to ask if I would like to force close Edge, which always obviously re-opens on each reboot or waking up from sleep mode. Thanks for this article. The registry has always seemed so strange and any time I've had to go into it I was worried the whole PC would be messed up. Very helpful! Very good. I always wondered how to back up the registry before making changes. Now all I need is a step-by-step on restoring the registry from the backup and I might try it some day. Derek: The registry backup file you create should (by default) have the .REG extension. I believe those files are known to the system as being a registry backup, and you only need to click on them to have their contents written to the registry. A .REG file may contain just one item, or the entire registry, or anything in between. I am not sure what happens if you have a registry backup, and then have added to registry, then restore the backup. Does it preserve the added items, or delete them? Registry editing is beyond me. So I have been using CCleaner to clean up my registry. After CCleaner was hacked in Sept. 2017, I have been afraid to update it. I haven't seen any recent reports about problems with CCleaner. Does anyone know if the latest version is safe to use? David T: Yes, it's safe to update C Cleaner. Mine has updated several times since September and it continues to work great. I remember when I used to have problems that required registry editing in the Win 95 days. All that great freeware that rarely seemed to play nicely with the rest of the software on my computer! I can't remember the last time I had to edit it, probably in Win XP, certainly not since I upgraded to Win 10 when it was free to do so. When I edit a file (like, say, a photo) and then do a "Save As..." it saves it in a totally different directory, on a different DRIVE, even. I'd like to find a way to make it save in the same folder as the original by DEFAULT. Is there a register edit to do that?